In order to get a general concept of organophosphorus pesticides with such a variety in structure and biological activities, consideration of each aspect of chemistry, biochemistry, and the applied sciences is necessary. This book consists of these three main parts. 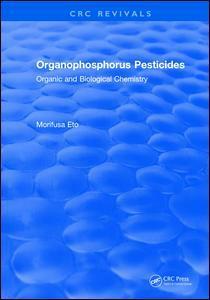 After the presentation of the background of phosphorus chemistry in Chapter 1, stress was put on the chemical and biochemical reactions of organophosphorus pesticides, including synthesis, analysis, metabolism mode of action, and other interesting aspects in Chapter 2 to 4, and on the structure-pesticidal activity relationship in Chapter 5.